As a person who lives in a colder climate, I have a wide selection of warm weather wear. This includes scarves, sweaters, and most definitely coats. I probably get at least one new one a year. When you wear them so often, you want options because they are really part of your outfit. This striped coat was my addition this year. At only $32 for it is definitely in my price point, too! It's fully lined and I am digging the relaxed fit. The only draw back is the pockets are a little far back for my taste. Today Lara from Cookies Cardio and Clothes is co-hosting. She recently got back from a work trip to Scotland which I loved reading about (how awesome is that!? The only work trip I do is to district office or a seminar in state for the day...*sigh*). I really enjoyed her GYPO Work Wear Challenge Recap, too! Go check her out! That striped coat is fabulous! It looks great on you! 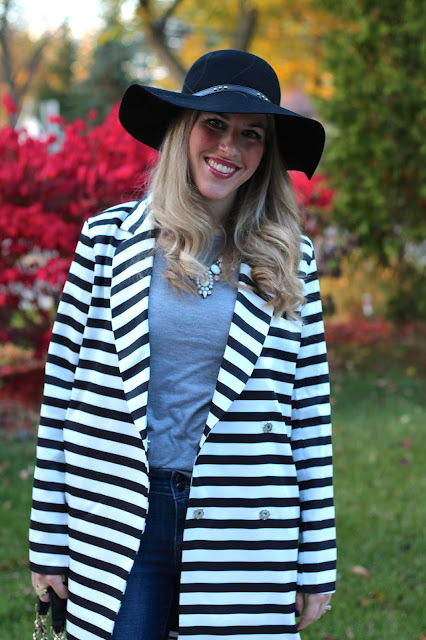 Loving that jacket and the hat is the perfect touch to top off the outfit. 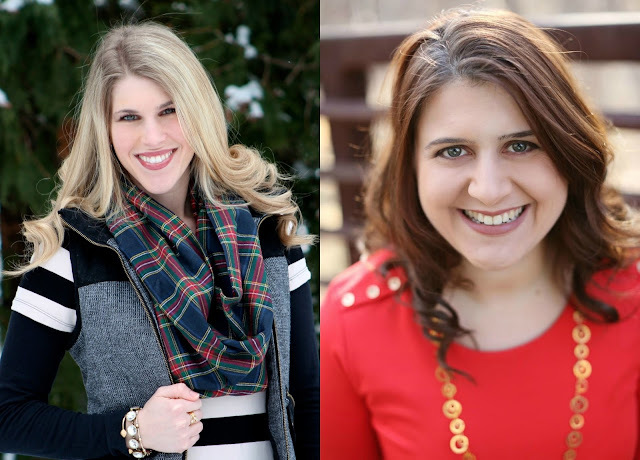 Hope to see you at my link up tomorrow! what a fun coat! it goes perfectly with that hat and bag. I love a bold coat like this, lady! You have been getting so many great pieces from SheIn! This coat is SO perfect for the fall and I just love the b/w stripes! I need this! Lol! 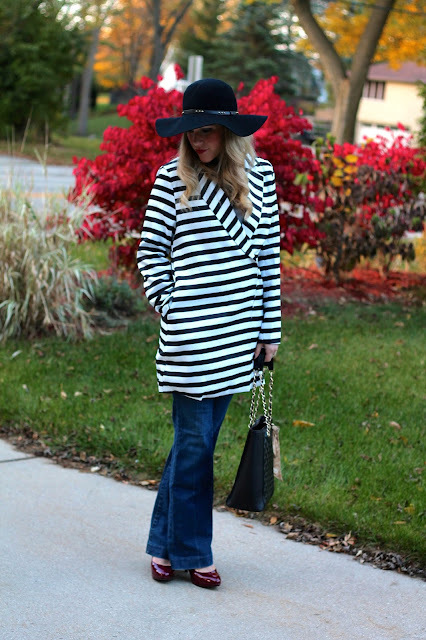 Love this striped coat and that you paired it with flares! Amazing look! Wow, a work trip to Scotland, I'm so jealous of her! Love that striped coat, you look lovely! the hat takes the look to the next level, love it! Such a pretty coat. I have been thinking of investing on another one this year myself. Laura, this coat is amazing. The whole outfit is so fun, elegant and beautiful and almost all of it is c/o -- how cool! Love your hat and heels too. I need a black and a marsala floppy hat for now. Your coat reminds me to get out my zebra striped trench coat, too. Thanks for introducing me to another blogger, too. That coat will take you places this Fall & Winter! 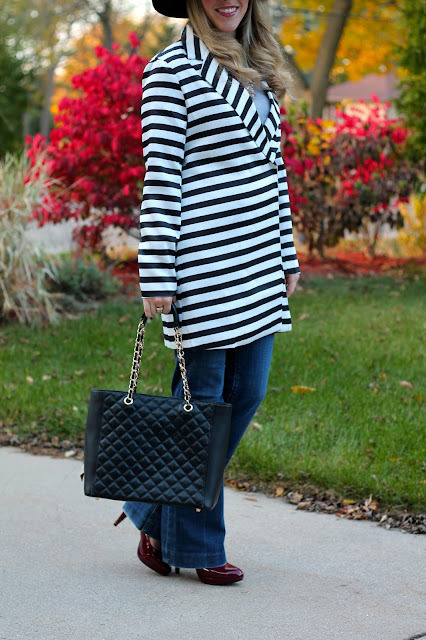 Oh my, that striped coat is to die for! Love it so much! Thanks again for letting me co-host! Love that coat! You styled it so well, love the hat! 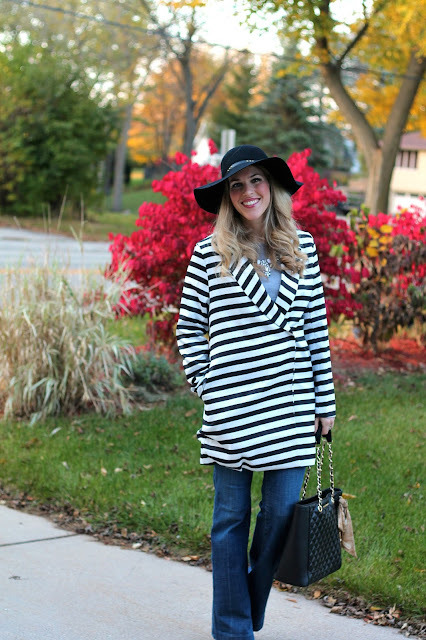 I have been on the hunt for a good striped coat forever! This one is right up my alley :) Love this look! What an amazing statement piece! It looks great with your floppy hat and flares. What a fun coat! I wished I lived in colder climates so I can buy more coats, I love them. I like having coat options. This is a great option! Love the stripes! Fun outerwear is a must in the cooler months. I'm totally with you - it's important to have tons of great outerwear options! 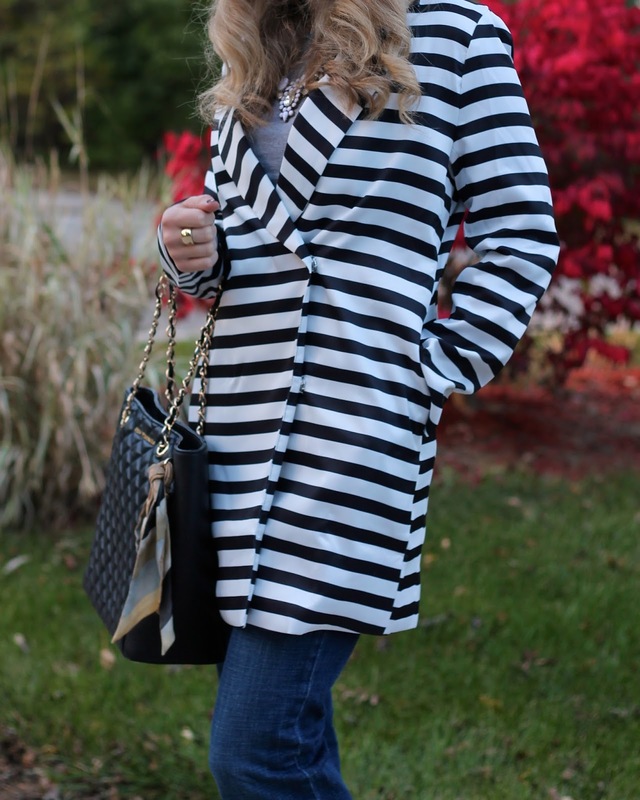 This striped coat makes a great statement, and you can't beat the price. This coat is amazing! such a bold piece. I totally agree--coats are key! Love the coat! You look so chic! Such a great piece to wear with that hat! That coat is adorable and you can rock a floppy hat girl! Loving that fall color behind you too. What a great look! I especially love the coat - gorgeous! This is such a lovely outfit! Wow, that jacket is really cheap! It's so pretty! Thanks for the link up! A striped coat is such a statement piece. Love how you styled it with the flare jeans and hat! I really love your stripe coat and your shoes! Both are great statement pieces to have! It seems like oversize coat will be in trend this fall/winter. Two thumbs up for your addition of that hat! I need to go back and find your post on SheIn sizing! I keep going to the site but am too afraid to purchase because I'm not sure of my size LOL. Loving this look today, especially your handbag. omg i am obsessed with this coat! it is gorgeous on you. Fabulous look, Laura!!! 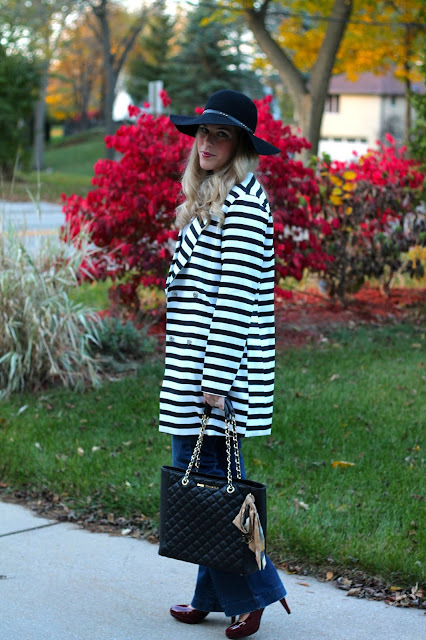 This coat and hat are perfect! They look amazing on you and great together.